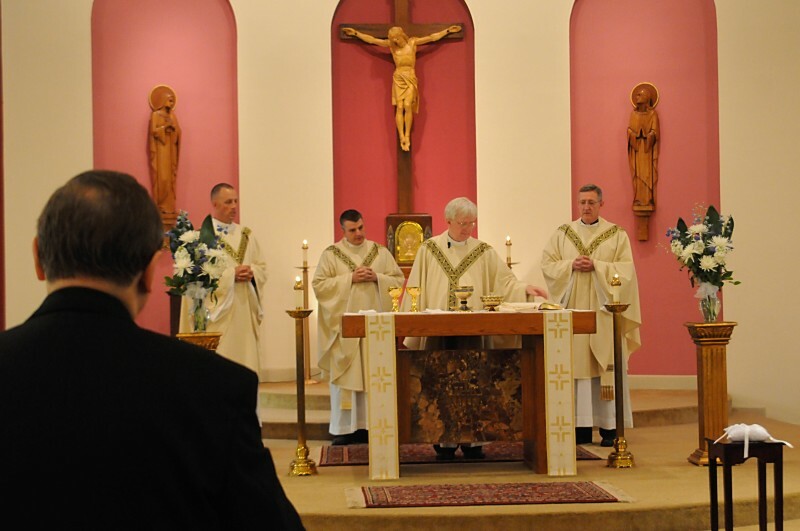 My Domestic Monastery: Five Favorites: First Communion Anniversary! Five Favorites: First Communion Anniversary! Linking up to the lovely Grace who's substituting for Hallie. In honor of our special anniversary...my five favorite things about the Eucharist! He's always there in the tabernacle! My senior year in high school I first discovered and fell in love with the practice of making visits to Jesus in the tabernacle (I lived in a tiny town in high school, and my house was literally down the street from the Catholic Church so it was sooo convenient!). My love for this practice grew in college, where there were chapels in every dorm and in most other buildings as well! It was pretty awesome. There are a few I may have not visited by I made a point of visiting every one I could. The chapels range from the very simple (one is an office building and is basically just a tiny conference room with chairs, an altar, and a tabernacle) to the positively gorgeous! These chapels in college were invaluable to me - because of the presence of Jesus there! He was (and is) such a comfort to me. As long as Jesus is in every tabernacle, I know I'll never be lonely!!! I LOVE the Mass. Daily Mass is easily my favorite form of prayer (even though it's much harder to come by since becoming a Mom!). I actually don't usually receive any sort of special consolation from going to Mass (although sometimes I do feel peace at Mass...those kind of extra special feelings are NOT an every Mass occurance...especially now that I have two little Stinkers in my life!). Instead, I find that the more I go to Mass the more the Eucharist truly becomes my "daily bread." I don't know how to describe it, but something is more complete and satisfied inside of me when I've had my daily dose of Jesus! From the earliest days of our relationship, the Abbot and I have always had a sort of unofficial motto (that we didn't really put into words until after we were married but we put into practice long before then!). Our motto is that whenever life seems overwhelming, whenever we have a problem to sort through or a joy to celebrate, we take it to Jesus in the Eucharist! I believe the time that the Abbot and I had together with Jesus in college, hanging out and talking in chapels during college and letting Jesus be a part of our time together, really formed our relationship. We fell in love with each other, yes, but we also began to fall in love with Jesus together! It was the beginning of our vocation! I told a friend recently that, whenever I am especially frustrated with the Abbot and wondering, "Why exactly did I marry him? How can we possibly stay married for life?" I remember that he is my partner in this journey to heaven...and I fall in love with him all over again! I could tell numerous stories of times when life seemed so hopeless, but we were given hope after bringing our family to Jesus in the Eucharist. One of my favorites was from the days right after Sister Stinky was born (literally right after she was born, I think...probably that first week!). We were exhausted, overwhelmed and I was extremely emotional. We were blessed, though, with a Catholic church that was only a few blocks from our house and which was open all day and pretty late into the evening. Overwhelmed, we took Sister Stinky there with us and sat and prayed in the darkened church, just feeling so overwhelmed. Unbeknownst to us, one of our priest friends from Notre Dame was actually placed at this parish and he just happened to walk in to this darkened church while we were praying there...and offered to give our new family a blessing on the spot! We all slept better that night, and we knew that God would give us the grace to keep going! 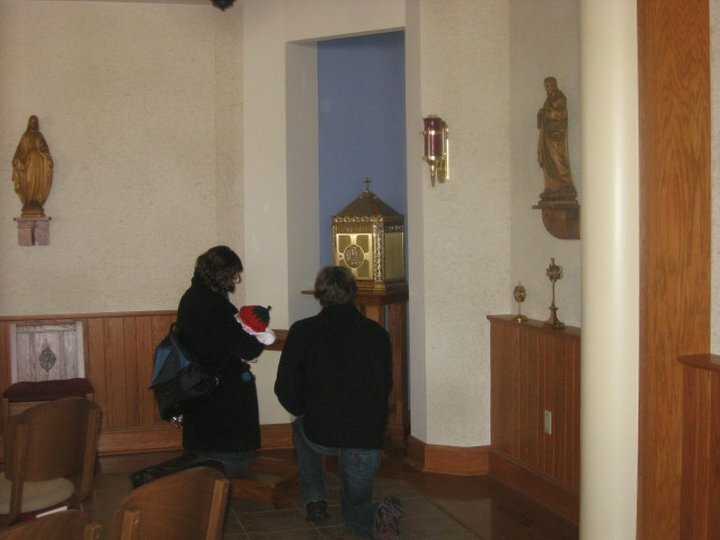 Do you have a perpetual adoration chapel near you? We've been blessed in that we've always lived close to places with regular adoration. If you're able to go on a date with your spouse or potential spouse - all the better! I truly believe that every moment you spend in adoration as a couple strengthens your bond! It is a great destination for dates!! But even that aside...it is a great destination for you to go personally. I think this is especially true for mothers, who often can't make it to daily Mass (how is it that daily Masses all seem to coincide so perfectly with wake-up or nap times for littles?!). It is such a gift to go and to be able to dump all your problems on Jesus. He is the one person who actually is big enough to take it! A taste of heaven on earth. Did you know that that is what is happening at every Mass?! I almost always forget that all the saints and angels are there with us at Mass! even nearer than the angels, when we touch his very flesh. Dwelling in each other's presence, I will hold you close inside. Every soul in heaven and earth now is present in the Body of Christ. Great post! I love that little strawberry hat and hope I'll get to see it on Baby Sister:) I think Danielle Rose's song is sooo beautiful! It really helped me deal with being separated from so many friends (you included) after college.